We are very thankful that you are considering sending your child to church camp at High Hill. We cannot stress how important we feel camp is to kids. There are so many aspects of fundamental growth that you get at church camp that you can’t get anywhere else. If at any point during the registration process you have questions, please don’t hesitate to call us at 636-585-2262 or email us at office@highhillcamp.org. 1. Online pre-registration will begin January 2nd, 2019. 4. Member Rates are for campers who attend our supporting churches (according to camp bylaws), or campers who are invited to come to camp by a member camper. 5. Early rates can be locked in by paying in full OR by simply paying a $25/camper deposit at any time between January 2nd and the early deadline. HOWEVER – Early Bird rates will only apply if tuition has been paid in full by the deadline. 6. All online registrations require a $25 credit card deposit. DEPOSITS ARE NON-REFUNDABLE. 7. Be sure to ask your church about discount codes or scholarships before registering. 9. Campers who are PAID IN FULL at least 24 hours before camp will be processed through our express registration line. 10. Once you have pre-registered your camper(s) you may pay any remaining balance due by simply clicking the button below. If you are unsure of your balance, please contact the camp office. TO VERIFY THAT WE RECEIVED YOUR REGISTRATION. We offer scholarships to campers who have a need for assistance to attend camp. REGISTER FOR ANY SESSION BY CLICKING ITS NAME BEGINNING JANUARY 2ND. Kick Start & Mother/Daughter Camps: Registration will be from 5-6 P.M. on Friday. Camp will end on Saturday at 4 P.M.
Camp 23-1: Registration will be from 3-5 P.M. on Sunday. The pool will be open from 3:30-5:00 P.M. for campers after they are registered and moved into their cabins. Camp will end on Tuesday at 11 A.M.
Camp 23-2: Registration will be from 3-5 P.M. on Thursday. The pool will be open from 3:30-5 P.M. for campers after they are registered and moved into their cabins. Camp will end on Saturday at 11 A.M.
Camp 45: Registration will be from 3-5 P.M. on Sunday. The pool will be open from 3:30-5 P.M. for campers after they are registered and moved into their cabins. Camp will end on Thursday at 11 A.M.
Jr. High, High School & Adventure Sports Camps: Registration will be from 3-5 P.M. on Sunday. The pool will be open from 3:30-5 P.M. for campers after they are registered and moved into their cabins. Camp will end on Friday at 11 A.M.
JH & HS Wild: Registration will be from 4-5 P.M. on Sunday. At 5:00, the campers will make their way down to the wilderness camp with the dean. Parents are more than welcome to stay until this time and go down to the campsite with their camper to help them get moved into their cabin. Camps will end Thursday at 1 P.M. Kid vs Wild: Registration will be from 4-5 P.M. on Thursday. At 5:00, the campers will make their way down to the wilderness camp with the dean. Parents are more than welcome to stay until this time and go down to the campsite with their camper to help them get moved into their cabin. Camp will end Saturday at 1 P.M. 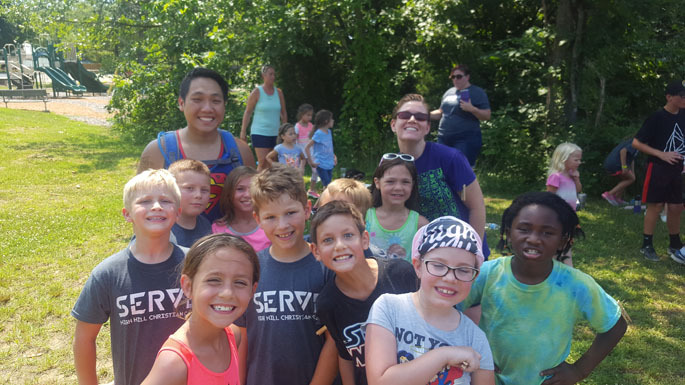 Adventure & Extreme Adventure Camps: Camp will begin with registration at 4 P.M. CAMPERS SHOULD GO DIRECTLY TO H&M CHRISTIAN RETREAT which is located at 2242 Hwy 19 S, Hermann, MO 65041 (property is actually 1.5 miles south of Swiss, MO). A Google Maps link can be found on our camp website. Camp will end with a meal for parents to enjoy with their campers. You will receive more information about that closer to camp.